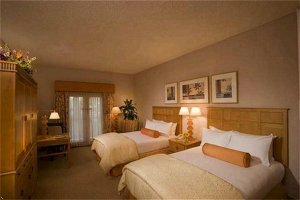 Located in Scottsdale, Arizona the Hilton Scottsdale Resort & Villas hotel offers impeccable accommodations in a beautiful resort-style setting. A warm welcome and exceptional luxury awaits, whether you are traveling for business or simply enjoying the beautiful Scottsdale sunny weather. Discover a magical retreat right in the heart of Scottsdale, Arizona. The new Villa accommodations at the Hilton Scottsdale Resort & Villas hotel redefines the resort experience. Inspired by the cactus studded Sonoran Desert, and nestled in its own secluded surroundings, with breath taking views of Camelback Mountain, one can ease their mind and restore their spirit. A warm sense of renewal awaits you in a peaceful, stirring atmosphere. Every amenity in our luxurious Villas was designed with your ultimate comfort in mind. The Hilton Scottsdale Resort & Villas hotel is a AAA Four-Diamond Resort, the top performing Hilton Resort for six consecutive years and is the perfect place to experience the best of Scottsdale, Arizona. We are located in the heart of downtown Scottsdale, Arizona within walking distance of the finest shops and restaurants and within minutes of Fashion Square Mall (the largest mall in the southwest) and historic Old Town Scottsdale. Hilton Scottsdale Resort & Villas Hotel's 190 spacious, beautifully appointed hotel rooms offer: Famous Hilton Serenity Bed with sumptuous linens for a luxurious sleep experience, Wireless high-speed Internet access and dual-line phones with voice mail, In-room safes, refrigerated mini-bars and coffee makers with complimentary coffee, Soft waffle robes, hair dryers, irons and ironing boards, In-room movies and video games. With 40,000 square-feet of flexible and versatile function space, the Hilton Scottsdale Resort & Villas hotel can host small intimate gatherings as well as mid-to large-scale gatherings and beautiful weddings. Let our Catering and personal wedding consultants help you to plan your event by assisting you in handling all the intricate details. Our Executive Chef will create the freshest and most innovative cuisine that you and your guests have ever seen or tasted. Our concierge will be pleased to coordinate a variety of activities such as desert jeep tours, hot air balloon rides, day trips to Sedona, Arizona and the Grand Canyon or golf at one of 125 championship courses. Hilton Scottsdale Resort & Villas Hotel's 45 spacious luxurious two-bedroom Villas offer: Nine 1,800 square foot two-bedroom Villas, Thirty-six 1,600 square foot two-bedroom Villas, Full kitchens including washer and dryers, High-speed wireless Internet service, Three flat-screen TV's (one 42 inch and two 32 inch TV's) with Bose Surround Sound, Private patios, Private pool exclusively for Villa guest use only, Wood burning fire places, Famous Hilton Serenity Bed and Bath Collection with sumptuous linens for a luxurious sleep experience. Hilton Scottsdale Resort & Villas Hotel Features: 40,000 square feet of versatile indoor and outdoor space, 187 well-appointed guest rooms, 12 luxurious suites, BlueFire Grille is open for breakfast, lunch and dinner. The menu features New World Cuisine with flavors from Native American, Caribbean, Latin America and Asian influences. Guests can also enjoy 24-hour in-room dining. The upscale restaurant at the Hilton Scottsdale Resort & Villas hotel, Fleming's Prime Steakhouse and Wine Bar, features 100 specialty wines by the glass. BlueFire Grille Grab & Go breakfast station featuring Starbuck's coffee. Oasis Bar and Grille is a lively spot for cocktails, sandwiches, salads or snacks. State-of-the-art Wellness Center featuring Cybex circuit machines and Precor cardiovascular equipment. Outdoor heated pool. Whether you are in Scottsdale, Arizona for business or to simply enjoy the relaxing environment, you'll be met with gracious hospitality and personalized service from our dedicated staff. Travel should take you places. From Sky Harbor Airport, take Hwy 51 North to Lincoln Drive exit. Turn right (east) on Lincoln. Take Lincoln to Scottsdale Road. The resort is located on the southeast corner of Lincoln and Scottsdale.